You are a new musician joining Barbara's GB Music recording studio. Choose an instrument and play along to a set of popular songs by tapping the screen or buttons at the right time. If you choose to be the vocalist then you have to sing into the microphone during the song. You can string your performances together with each instrument to compose a whole song. The game can be played with wireless, single card multiplayer. 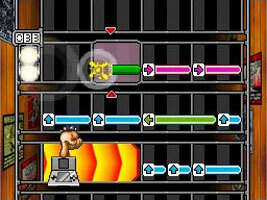 The players can compose their own songs together. A "Request Selection" expansion cart was released later. This cart could be placed in the Nintendo DS or Nintendo DS Lite GBA cartridge slot, and would increase the number of available songs in Daigassō! Band Brothers. This included many fan requests.